Casanovas Kiss is Sydney's most dynamic reception cover band , entertaining Australia's leading corporate entities including; Microsoft Christmas Party, NRMA Annual Dinner, AMP corporate, Goldman Sachs JB Were Christmas Party, BHP Blue Scope Steel, Samsung Product Launch, NSW Rugby, Sydney Olympic Park and Deacons. Casanovas Kiss is the perfect band for your private,corporate or charity event. They have a vast repertoire, effortlessly blending, jazz, chill out, soul, R&B and dance with ease. Casanovas Kiss have a wealth of musical experience. Collectively they have played in Australia and abroad in the field of Pop, Jazz and Dance. They have played in the premier venues throughout Australia from the Basement to the Sydney Opera House and the Entertainment Centre. They have performed at thousands of corporate functions, events and weddings. Casanovas Kiss are indeed a consumate ,entertaining band. Their presence and sophisticated sound will continue to resonate with you long after your event has ended. 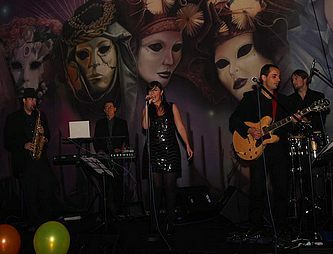 If you are looking at making your event a unique occasion then let Casanovas Kiss seduce you with their sound and grooves.